The market is full of different types of Headsets to fulfill the various demands of the customers. New generation earphones and headsets come with extra-ordinary features. You can bring the best of sound quality and audio quality with new generation headset. If you drive a lot, there are many types of headsets and earphones available in the market. 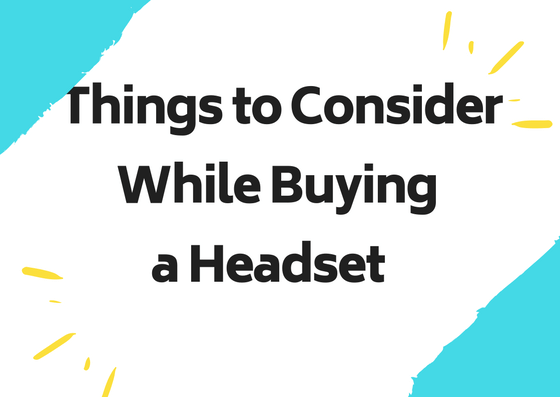 Selecting the suitable headsets for you while driving is a bit confusing, and before buying it, you must consider a few things. Check out the list of things which you should consider before making up your final choice on purchasing the new Bluetooth Headset for Truckers. Different headsets come with various aspects, and for that reason, you must know about all the technical elements which are essential for you while you drive. The headset makes it easier for the truckers to communicate even while they drive. In the modern world, most truckers wear a suitable Headset while driving so that they can pick up the essential calls and can listen to music from their smartphones. If you’ve been fond of listening to different kinds of music, then you should consider this feature first on the headset. While you drive, your truck engine makes noise which reduces the listening capabilities of the headset. To make your headset sound useful and crystal clear, you need to see whether the headset has noise isolation and cancellation features or not. Check for the noise-cancellation feature before you hit the Purchase button. Headsets come in different shapes and sizes. You must know your necessary requirements first before searching for the Headset in the market. In-ear headset is small and fits into the holes of your ear, while the on-ear Headset covers the entire ears. As per your basic needs, you can search for the right headset from in-ear and on-ear categories. To know about the build quality and the material used to design the Headsets, you must check for the details on the box cover or the webpage. The high-grade material offers durable headsets which add up more life to your earphones. You can use it for years without damaging it. You should also consider this aspect before making up your final decision. Many new Headsets come with different sizes; they come with Closed and Open back which also affect the quality of the sound. They both come with a list of pros and cons. You must check for the type of the Headsets first. It affects the sound quality and voice quality while you make a voice calls and talk using the same. New generation Headsets come with Bluetooth compatibility which lets you use the headsets without wires. You have to figure out whether you need a wired headset or wireless. If you are purchasing the new headsets while you drive, then you must go with the wireless headsets from the market. You would get plenty of options while choosing a Wireless Headset which comes with Bluetooth functionality. You just need to enable the Bluetooth button and connect it with your smartphones. You can receive phone calls and can command various things using Google Assistant or Siri or any other Virtual Voice Assistant. You will use the headsets for hours and for that reason, you must check for whether it is comfortable for you or not. If you go with the on-ear headset, you need to check the adjustable function on it. You can read out the reviews and feedback from other buyers on the same. This will give you more clear ideas about buying a new Headset while you drive. Since you are going to use the Headsets for covering the long distance, you need to check for the battery life of the Bluetooth Headsets. Yes, you need to see the battery backup of the headsets with a single charge. All the details will be listed down on the box or on a particular page from where you are going to purchase it. You must check for it to know whether it fulfills your desires or not.